It mixes grace with vigour, it associates strength with finesse and all these opposing qualities, once conciliated, make up an admirable sythesis of a unique generosity and complete virtue. Let us survey these places together, which once lovingly chosen, make up the village of Gevrey-Chambertin. Let us begin by the first of them. In Dérée, a superb plot of land, situated in midhillside in the direction of the little village of Brochon, well exposed and well drained, it makes up the powerful frame of our Gevrey. Its name probably evoked ” desert ” in Gaulish times or a fallow land indifferent to cultivation because of the difficulty involved in working it. The plot of land known as Champérrier, a neighbour of the first one, gives us wines which make people marvel at their density and their texture. 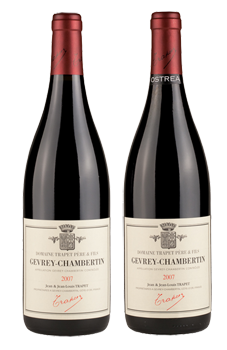 It is the oldest Gevrey vine, planted by Pierre Arthur Trapet in 1919. Let us come closer to the old castle and the centre of Gevrey, where our Clos de Combe is situated. Surrounded by beautiful dry- stone walls, it offers us firm, coloured wines which are full-bodied and delicious. The word ” Combe ” refers here to the place where the relief is indented and grooved. In the direction of the Great Vintages, the Petite Jouise shows off its beautiful ” queulles ” of more than fifty years old. Its name reveals the existence of sinister-looking forks in the Middle Ages. In this place seigniorial justice was practiced. This vintage has fortunately lost its wooden forks, nowadays replaced by stakes which support a vine of grapes of great finesse. Let us finish off our tour by a place named Vigne Belle : a place where the vine is beautiful and prosperous. Permanent aspiration of the wine-maker. The beautiful vine with the subtile bunches makes the sap of our soils intelligible.